Ever wonder why some photos are shared all over social media and others aren’t? The Internet is becoming increasingly visual, so photos that aren’t in focus or don’t feature interesting subject matter tend to be overlooked and under-shared. But when you post photos that encourage your social media followers to share the images with others, you increase your online audience and potential fan base! 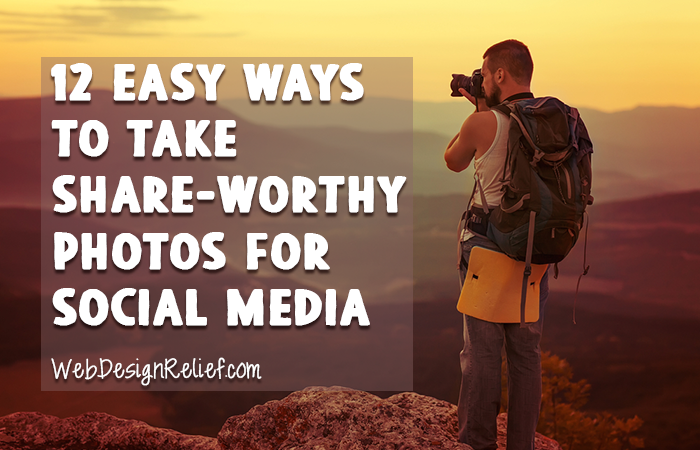 Whether you’re traveling on vacation or staying home trying to get the perfect picture of your wiggly dog, these simple photography tips will help you take better—and more share-worthy—photos to post on your social networks. Be creative. Instead of photographing your family lined up in front of a fountain and forcing fake smiles, coach your subjects to be playful, natural, and fun. The more interesting your picture, the more likely it will be shared. Watch your background. Distracting background objects (like when it appears that a flagpole is growing out of a person’s cranium) can ruin an otherwise great photo. Use natural light. Nothing’s more flattering, forgiving, or luminous than natural light. Just be sure that your subject isn’t backlit (creating a silhouette effect) or drenched in too much sun (oversaturated). Don’t mistake the flash on your smartphone for a real flash. When you use the flash on your smartphone, you’re actually just exposing your subject to a timed amount of LED light from your built-in flashlight—and that’s why taking photos in low lighting is hard to do on a cell phone. Unfortunately, there’s no perfect way around this problem. Try moving into better light, or seeing if your phone’s low light setting helps. Fill your frame. In writing, you don’t waste a word. And in photography, you don’t waste a pixel of space. Remember: everything in your picture is your picture. Eliminate shadows when possible, especially on faces. Harsh light can create harsh shadows, making noses and foreheads look overly pronounced. Don’t center your subject. Instead, go for a professional look by offsetting your subject at the halfway point between the middle and edge of your shot. Follow the rule of thirds. If you’ve never heard of this photocomposition rule, you can learn more about it here. Embrace the odd. Generally, odd-numbered groups of things tend to read better in photos than even numbers. So if there are six trees before you, shoot only five. Don’t zoom. If you’re using a smartphone or other digital camera, your zoom feature may lead to pictures that are grainy and pixilated. Take your shot without zoom, and use a photo-editing program like Photoshop to crop your picture later. Stabilize. Even a little blur can ruin a great shot. Prop your elbows on something to hold your camera steady, or get a tripod. Order an app. Cell phone photographers can make use of the great apps that allow for simple custom touch-ups on the go. Check out Snapseed, Photoshop Express, or iPhoto. Set aside time to practice your photography skills so that when a picture-perfect moment presents itself, you’re ready for action. Though learning to take great photos may seem like a waste of time (especially if you’re a writer who would rather be writing! ), remember that nothing is more powerful (or more sharable!) on social media than a strong image. By learning to take great shots, you’ll have a new way to build your online reputation as a writer with share-worthy content. QUESTION: Which of these photography tips do you already use for your social media snapshots? Share one of your own. That advice is 15-20 years out of date. Don’t expect DIGITAL zoom to actually do anything. (You’re not “zooming” at all, just using fewer pixels on your sensor.) OPTICAL zoom (a natural for DSLR’s and almost any half-decent point-and-shoot digital made today) has little effect on pixelation. And yes, they do make zoom lenses for smartphones.